/ Modified aug 9, 2016 3:13 p.m.
Pima County Supervisor Sharon Bronson was rescued from this car after it was washed off a road on the near north side of Tucson. Rainfall subsided Tuesday afternoon in Tucson, after a morning downpour that dropped more than two inches, closed roads and slowed traffic throughout the metro area. 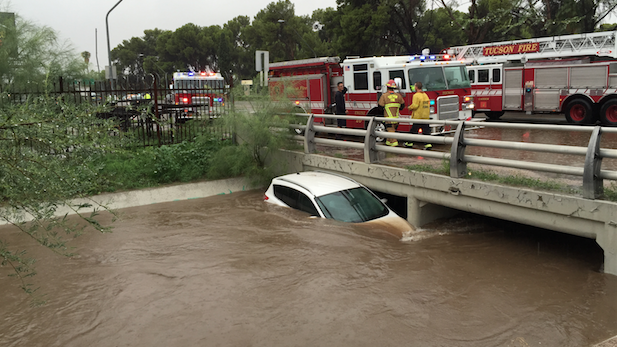 The Tucson Fire Department reported responding to 75 storm-related incidents, including the rescue of Pima County Supervisor Sharon Bronson from her flooding car in a wash on the near north side of Tucson. Bronson was unharmed, and a county press release said "her vehicle was swept by flood waters into the Cemetery Wash, ultimately coming to rest against the culvert beneath Oracle Road." Bronson was quoted as saying there were no barriers on the street that the wash crossed. Flooding remained a possibility throughout the region, especially in Southeastern Arizona, the National Weather Service warned. A flash flood warning was downgraded Tuesday afternoon to a flash flood watch, which was in effect for most of Southern Arizona, including Tucson, Santa Cruz County, Cochise County, the southern part of Pinal County and the Tohono O'odham Nation. "We still have some strong flows in washes around Southeast Arizona that got hit hardest in parts of Santa Cruz County and parts of Eastern Pima County," meteorologist Ken Drozd of the National Weather Service said. The heavy rainfall around the Tucson area gave way to a light steady drizzle around mid day. The morning downpour of almost 2.5 inches in some places closed 10 roads in Pima County. Drozd warned that because the ground is heavily saturated, even light rain can cause flooding in residential areas that are flood prone. He advised sandbagging as a precaution. More rain was forecast Wednesday and Thursday with skies clearing on Friday. The rain is from Tropical Storm Javier, which hit Baja California Monday and Tuesday. National Weather Service officials said Monday that the then expected heavy rainfall would likely bring the summer monsoon rain totals to their normal levels. In Tucson, that would be slightly more than 6 inches for the full monsoon season, June 15 to Sept. 30.